You know, one of the things that's really nice about this office is that we don't really have much in the way of "office politics" and very, if any, gossip that floats around. It can be something that can totally ruin a fine workplace, when there are gossip-spreaders mixed in with the rest. Thankfully, something that can ruin a workplace can actually make a pretty intriguing card game. 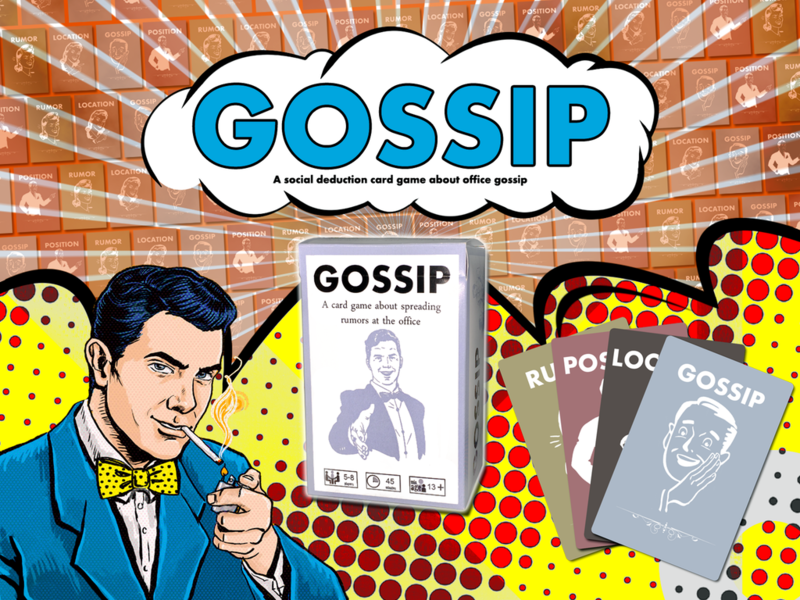 In Gossip, 5-8 players must use deduction in order to find out who is spreading gossip around the office and do their best to squelch it all out whenever possible. Secretly, you'll either be a gossip-spreader or a gossip-squasher. But more than that, each of you has different roles within the office and different places where you can make your accusations. You must save the office from low morale before the gossip-spreaders make your job a terrible place to be. The campaign is about 1/4 funded and still has 27 days left to go.